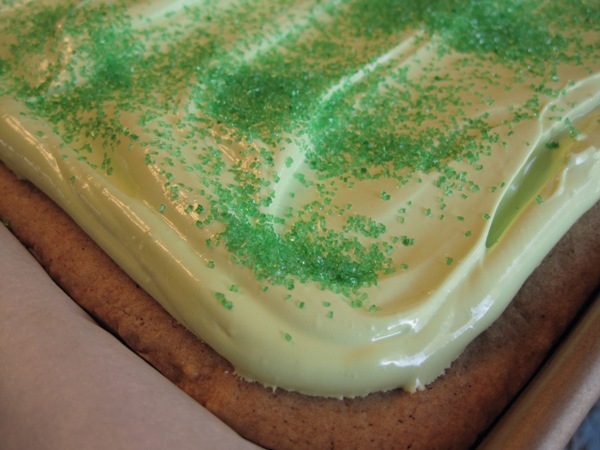 These cookie bars are soft and cake like. A nice neutral canvas for a yummy icing. . . Except I ran out of butter!!!!! Can you believe that? The horror. . . I was planning on a nice buttercream on these! I guess sometimes you just have to alter the plan so I decided to take inspiration from a couple very old cookbooks. And in one of them I found a gem. It’s yummy and marshmallowy (yes, that’s a word) and could be flavored in so many ways! I stuck with vanilla but I was imagining all the possibilities. Coconut (I’m a huge fan), almond, rum! 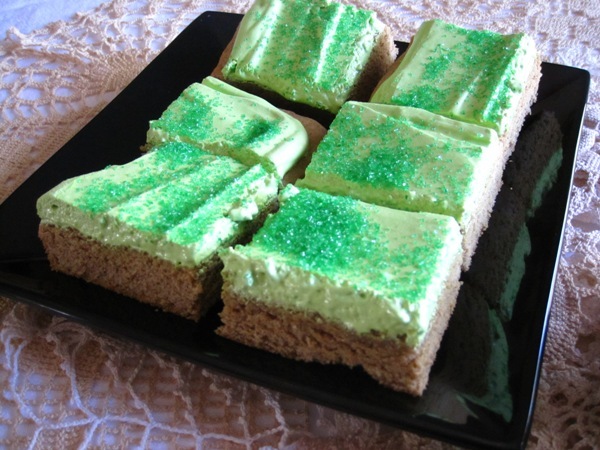 You could probably even use some whiskey or Irish cream to flavor these for a more Irish spin. This makes a pretty big pan. You’ll need a 13 x 18 (half) sheet pan. Line the pan with parchment to make taking them out easy. The cookie itself is very cake like. It’s light and soft. Part of the flour is wheat but you could use all white if you don’t like wheat or don’t have it. 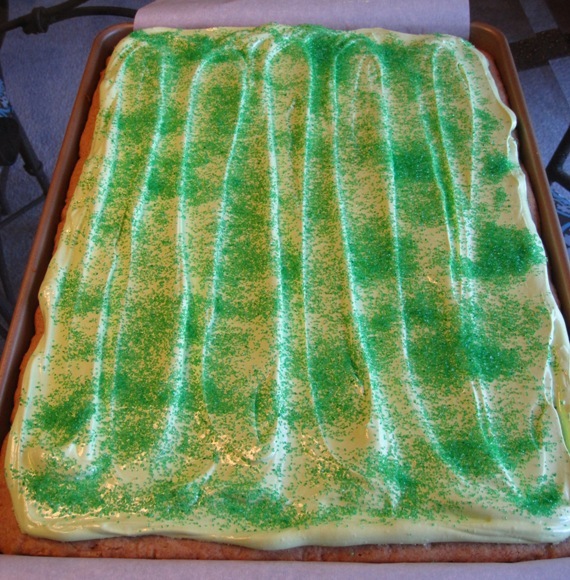 The icing is thick on these but it is so light that it isn’t overwhelming. I have actually decided these are tastier the day after you bake them. They were good yesterday. . but they are better today. Some things get better with age. Just like I do! The color of these could easily be tailored to whatever season it is. Easter, Halloween, Christmas, etc. . . 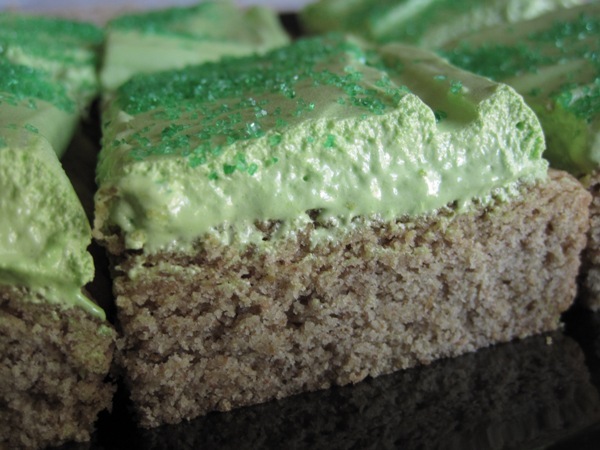 I used green coloring on these and topped them with some green sanding sugar. 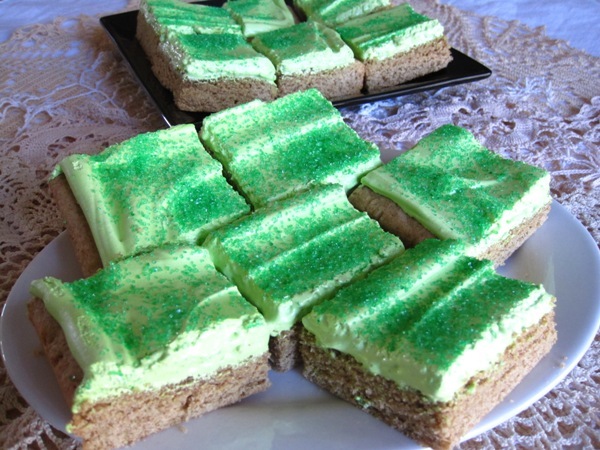 Some little sprinkles shaped like shamrocks would have been cute, too. In a large mixing bowl, cream the butter and sugars together. Whip for 3-4 minutes until the mixture is very light and fluffy. Add the eggs one at a time. Add the vanilla. In a large bowl mix the flours, soda and salt. Add half the dry mix to the butter mixture and mix in. Add the other half and mix until everything is well combined. On a parchment lined 13 x 18 sheet pan, spread the dough. It will be sticky. I used greased fingers to push it into all the corners evenly. Bake at 375 degrees for 12-15 minutes or until lightly golden. Allow to cool and then ice. This frosting recipe came from The Settlement Cook Book. If you don’t know this cookbook you can find the history of it here. Suffice it to say that it’s a very old cookbook with some funky old school recipes. Original copyright is 1901. Sometimes those old cookbooks can be a wealth of ideas! Don’t be scared. . it’s a cooked frosting. Similar to a 7 minute icing if you are familiar with that. You won’t even need a thermometer. Just keep a close eye on it. It will take you about 15 minutes to make but the end result is light and fluffy and yummy. . in other words, it’s worth the effort. In a saucepan over medium heat add sugar and water. Do not stir. Let cook at a rolling boil for 10-12 minutes until it just barely takes on a tinge of amber color. Add 6 marshmallow and stir in to melt into the sugar mixture. 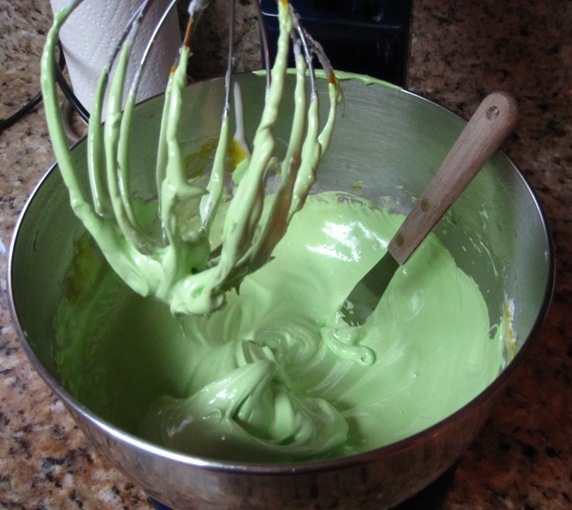 While the sugar cooks, in the bowl of a stand mixer whip your egg whites until they form stiff peaks. Turn the mixer off and wait for the sugar syrup to be ready. Once the marshmallows have melted into the sugar mixture, very carefully pour it in to the mixing bowl in a slow stream. The mixer should be on a low speed. This is going to cook your egg white. Once it is all incorporated and shiny add the salt and the vanilla. And then whip it on high for a few minutes until it is fluffy and super shiny! 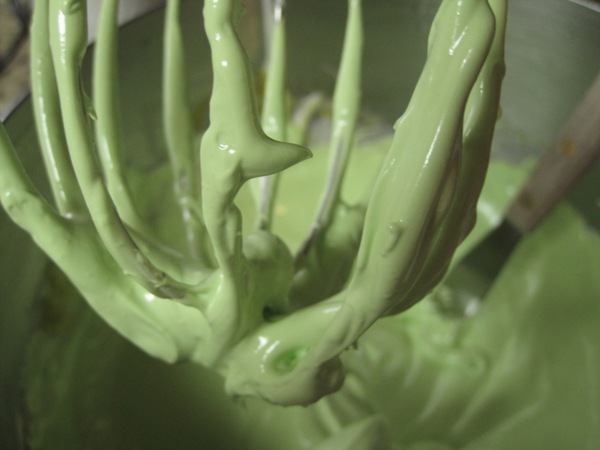 This is the point you would also add your food coloring if you are using it. girl…the next time a house goes up for sale next to you….I’m buyin!